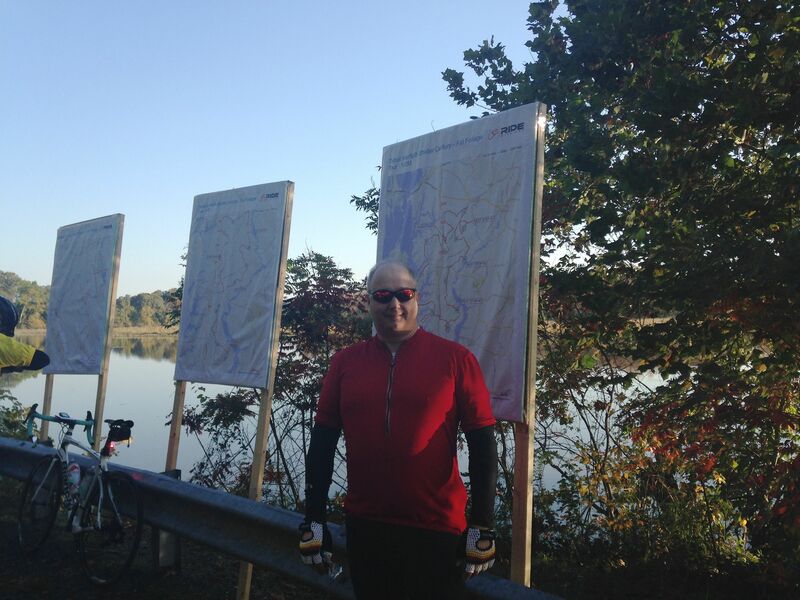 Today’s ride: The Shelter Century Fall Foliage Tour is a charity ride out of Easton, MD. 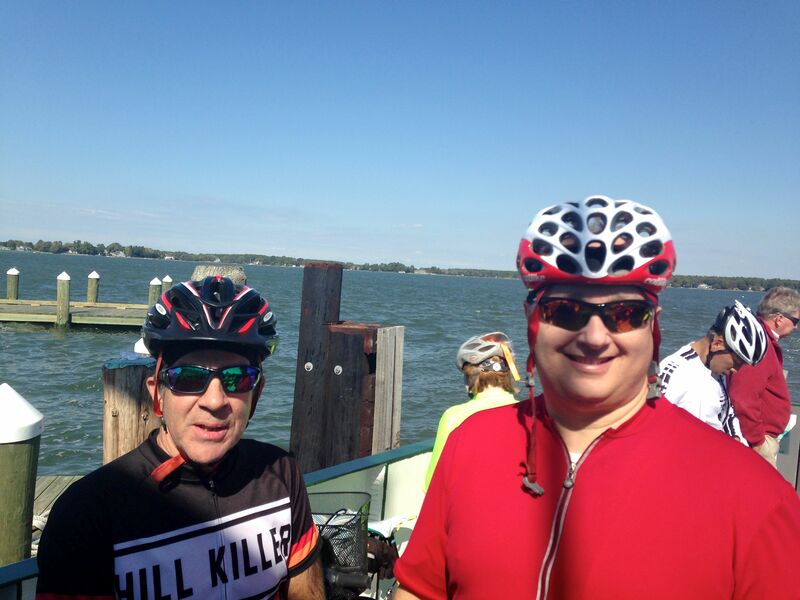 The majority of the ride is on the eastern side of route 50, with stops on the Choptank River and pastoral views. The ride also features a ferry ride across the Tred Avon River from Oxford MD to Bellevue MD, and while the course is not challenging for terrain, the challenge of this ride is coping with the wind. The ride itself is flat as a tabletop, and very scenic. The finish promised homemade pies! The Experience: I was recovering from the flu when I set out alongside many of the usual suspects on this ride; Ron Tripp, Rita Spence, Eric Sanne, John Koehnlein and Tom Roman. A wise man would not have ridden 100 miles in that condition, but I am a stubborn man, not a wise man. I felt okay at the start, so I convinced myself that I’d be okay to go the distance. The batteries in my computer were wearing out – in the cool of the morning my display cut out, though it came back when the temperature warmed up, by which time it wasn’t of much use to me. None the less, the weather was beautiful that day, and I was still feeling fine, and I just turned the cranks and enjoyed the morning. There were no road marks for this ride. Only signs placed at turns, so the cue sheet was important. Had there been more of the signs, that would have been no issue, but there was only one sign at turns, and with crossing routes it was important not to miss a sign, so consulting the cue sheet was very important. In the first 50 miles, there were 3 rest stops, all of which were on the water with great views. The problems were logistic. The stop at 50 miles ran out of water and gatorade; two things no rider wants to be without. In the last 50 miles, there was only 1 rest stop, at the ferry landing in Oxford at 77.5 miles. In a ride where you’re battling headwinds, 27.5 miles is a long way to go without a break. Thankfully the day wasn’t hot, which would have made matters more difficult. A water stop would have been welcome to break that segment up. However, my personal condition was a more questionable matter. By 70 miles I was having real trouble breathing; the flu wasn’t completely through with me yet and struggling into the wind took a lot out of me. Thankfully after the ferry ride the winds were with us more; I rallied a little. John kept an eye on me as I suffered through the final 5 or 6 miles; but I managed to complete the ride and earned the rest at the end. Had I shortened the ride to a metric century, my body would have been happier. Had I not ridden at all, my body would have been happier still. But as a stubborn man I simply couldn’t let myself heal. While I paid the bill for that the following day, on that day the ride was inviting, so I soldiered on. Had I been in better health, I think I would have enjoyed this ride a lot more than I did, and I found a lot to recommend about this ride despite the organizational deficiencies. Selections from my mental iPod during the ride: “And if Venice is Sinking” and “The Hammer and The Bell” by Spirit of the West, and “Panic” by The Smiths. Stats: 101.5 Miles ridden. A good day to ride, through a scenic area with a ferry ride to make it memorable. At the first rest stop, in front of course maps. With John on the Oxford Ferry. 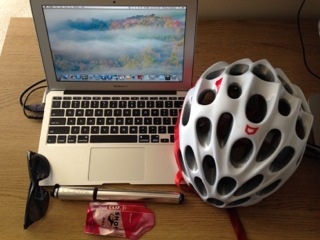 This entry was posted in Cycling on October 22, 2014 by kitefencer.